The Willow Wood Coffee Morning is always popular and very well attended. 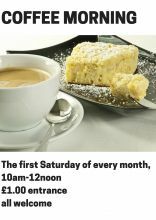 Starting at 10am on the first Saturday of every month it's a great opportunity to catch up with friends old and new. We have coffee (or tea) and cakes, and a number of stalls to browse. There's always a raffle with a range of prizes and it's a lovely way to spend a Saturday morning. If you've never been why not call in this month? It's open until 12 noon and entrance is just £1.